Location: Haddington, East Lothian, Scotland. Notes: Barnes Castle is an unfinished castle, with a number of defensive banks, on the slope of the Garleton Hills, located 5 kilometres (3.1 mi) north-east of Haddington and close to Athelstaneford in East Lothian, Scotland. 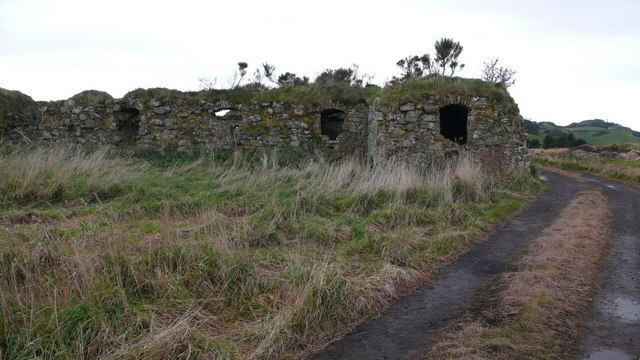 The remains, also known as Barney Vaults, are protected as a category B listed building. The castle was started by Sir John Seton of Barnes, diplomat at the court of Philip II of Spain and later James VI's Treasurer of the Household and an Extraordinary Lord of Session, who died in 1594. The entrance gate was in the centre of the south-west wall. For its time it was of a modern and symmetrical design.